PARIS, 21st July 2017 (VCHR – IBIB) – Police and local authorities in Huế harassed, intimidated and intercepted members of the Buddhist Youth Movement (BYM – Gia Đình Phật tử Việt Nam) as they organized the movement’s annual Summer Camp in Huế. This incident takes place as Vietnam prepares to enact its very first Law on Belief and Religion which will effectively outlaw religious activities conducted by non-registered groups such as the BYM, an affiliate of the independent Unified Buddhist Church of Vietnam (UBCV). Under the new law, the definition of a religious organization is “a grouping of believers, dignitaries, auxiliaries and clergy of a religion, which is organized according to a given structure recognized by the State” (our emphasis) (Article 2.12). Once the law comes into force on 1st January 2018, religious organizations which cannot or choose not to register with the state will have no legal safeguards for conducting religious activities. Over the past months, the government has been racing to prepare for the law’s enforcement. On 8th March 2017, Prime Minister Nguyễn Xuân Phúc issued Decision 306/QĐ-TTg with a “Plan to Implement the Law on Belief and Religion” calling on government agencies at all levels to “establish a roadmap to guarantee that the Law will be implemented in a uniform, complete and synchronized manner on a nationwide scale by 1st January 2018”. A follow-up plan was issued by the Ministry of the Interior on 29th March. The plans will be overseen by the Ministry of the Interior in collaboration with the Government Board of Religious Affairs, the Prime Minister’s Office, the Communist Party’s Central Mobilization Department, the Vietnam Fatherland Front and the Ministries of Finance, Justice and Public Security. Alongside training and deployment of religious cadres, the Plans call for increased vigilance and sanctions against those who “violate regulations on religion or belief”. 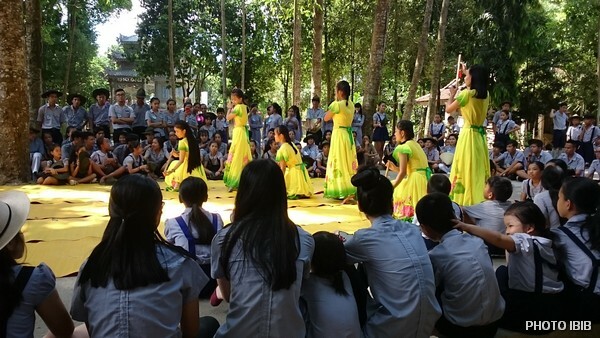 “The recent crackdown on the BYM’s Summer Camp is a typical example of Vietnam’s two-faced religious policies”, said Võ Văn Ái, VCHR President and international spokesman of the UBCV. “Whilst the state claims to protect freedom of religion or belief, it clamps down on the activities of a Buddhist educational movement which seeks simply to impart the values of tolerance, compassion and understanding to the younger generation”. 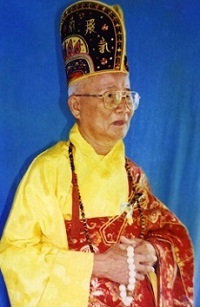 Mr. Ái added that the BYM’s guiding principles are enshrined in its motto “Bi – Trí – Dũng” – compassion, wisdom and courage. On 12th July 2017, the BYM prepared to hold the “Hiếu – Hạnh” camp at the Long Quang Pagoda in Huế for members from 8-16 years old. The camps are held each year on the festival of the Buddhist Goddess of Compassion (Quán Thế Âm), whilst monks and nuns are engaged in their summer retreat. They are a favourite meeting place for young UBCV Buddhists who come from all over the province and work hard to prepare the camp’s activities and cultural events. Because of its affiliation with the UBCV, the BYM’s camps are frequently disturbed by the Police, but harassments this year were particularly harsh. 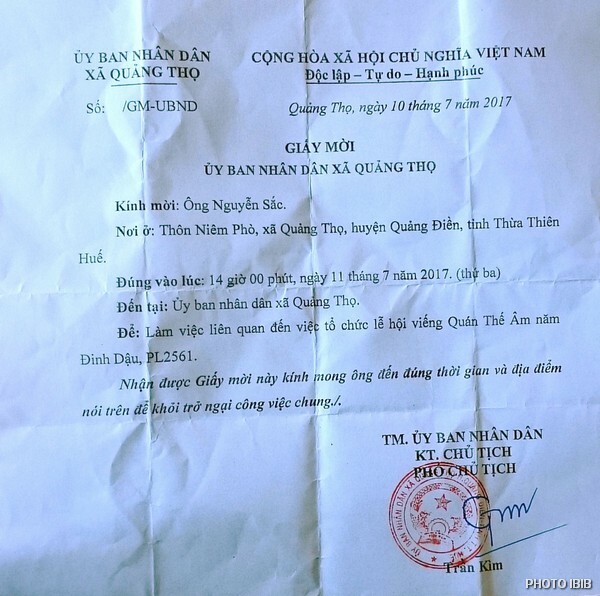 However, on 10th July 2017, BYM leaders Lê Văn Khá and Lê Văn Thọ of the BYM section in Hòa Đa Tây were summoned for “working sessions” (interrogations) by the local authorities and pressured not to allow their members to attend the camp. The following day, almost all BYM leaders in the province had received similar convocations from the Police and local authorities (see the summons issued to a BYM leader by the local People’s Committee for (sic) “working sessions on the organization of festivities concerning the Bodhisattva of Compassion Quán Thế Âm”. During the night of 11th July, Police surrounded the homes of Văn Đình Tất, BYM leader of Quảng Điền district and Trương Phiên, leader of the Hiếu Hạnh camp and prohibited them from leaving their homes. In many localities, Police visited the homes of BYM members and threatened parents not to let their children attend the camp. On the morning of 12th July, BYM leaders Ngô Đức Tiến, Nguyễn Văn Đê (from Phú Vang district), Hoàng Tánh, Văn Đình Tất (Quảng Điền district), Lê Thị Kim Thông (Phong Điền district), Nguyễn Văn Lành and Tôn Thất Kỳ Nam (Phú Lộc district) were all intercepted by Police and forbidden to attend the event. In Nước Ngọt and Hải Nhuận districts, as children were about to board buses taking them to Huế, Police intercepted the buses, prevented the children from boarding and forced the drivers to turn back. In face of these arbitrary harassments by the local authorities, during the early hours of 12th July, parents, friends and BYM members organized an impromptu transport network, using bicycles, motorcycles and private cars to bring their children to the camp. By 8.30am on 12th July when the Camp was declared open, 435 young members of the Buddhist Youth Movement were present to take part in the event. 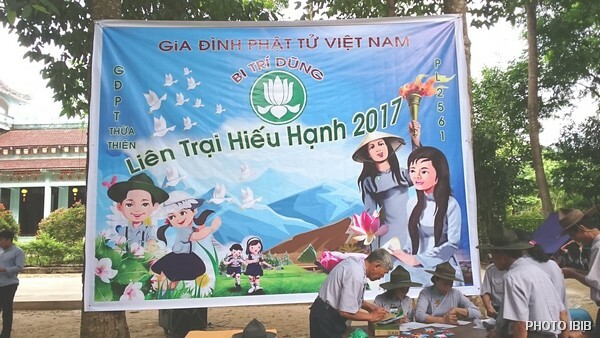 The Buddhist Youth Movement (Gia Đình Phật tử Việt Nam), is an unofficial educational organization based on the Scouts movement. 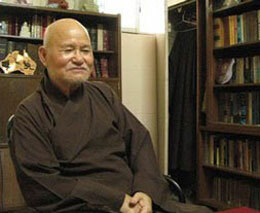 Founded in 1943 and affiliated to the UBCV, it has a membership of 300,000 members nationwide in Vietnam.